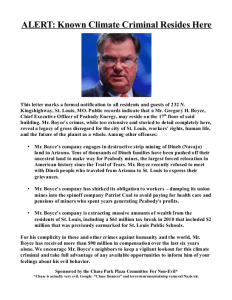 Two activists were arrested for distributing this flyer near the apartment of Peabody Energy CEO Greg Boyce on Tuesday inside the Chase Park Plaza hotel and apartment complex. The activists were charged with disturbing the peace and released after eight hours in custody. Earlier that morning, a small group known as the “Chase Park Plaza Committee for Non-Evil” leafletted inside the building’s parking garage, posting warnings to tenants and guests that Boyce, a “known climate criminal,” resides inside the building. The flyer states: “Mr. Boyce’s crimes, while too extensive and storied to detail completely here, reveal a legacy of gross disregard for the city of St. Louis, workers’ rights, human life, and the future of the planet as a whole,” and features criticism of Peabody’s complicity in the forced relocation of Dineh (Navajo) families from their ancestral homeland in Black Mesa, Arizona. Activists also used the flyer to highlight Peabody’s efforts to shirk on their obligations to retired coal miners, as well as the massive $61 million tax break that Peabody received from the city of St. Louis in 2010. 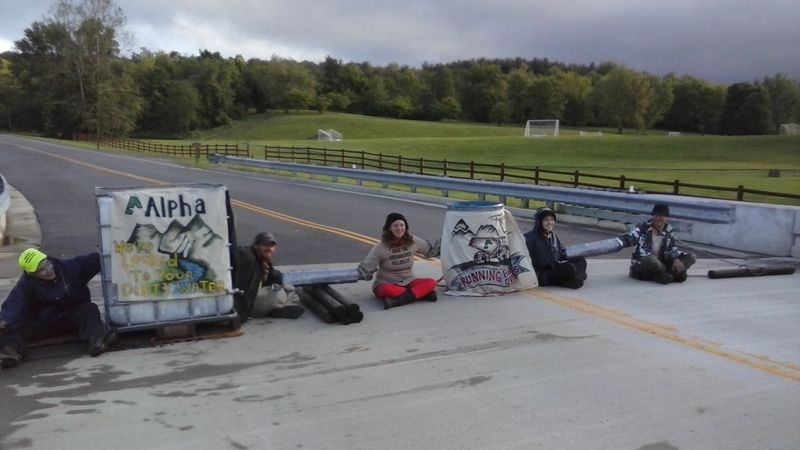 Lockdown at Maggie’s Farm – Food Not Fracking! 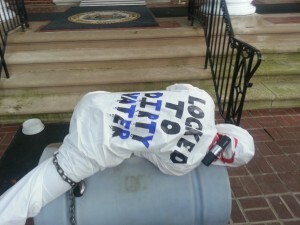 Bessemer, PA – This afternoon, residents of Western Pennsylvania and friends of Lawrence County farmer Maggie Henry locked themselves to a giant paper-mache pig in the entrance to a Shell natural gas well site in order to protest the company’s threat to local agriculture and food safety. The newly-constructed gas well is located less than 4,000 feet from Henry’s organic pig farm. The camp will feature a 2-week (Jan 7-20) and 3-week (Jan 7-27) option. There will be two featured tracks, direct action and community organizing, with significant overlap and emphasis put on how these fundamental aspects of resistance fit together. Both tracks will include multiple actions targeting extractive industries and provide a solid set of skills that can be used in any campaign. Both tracks are a full-time commitment and will include intensive training and hands-on experience. 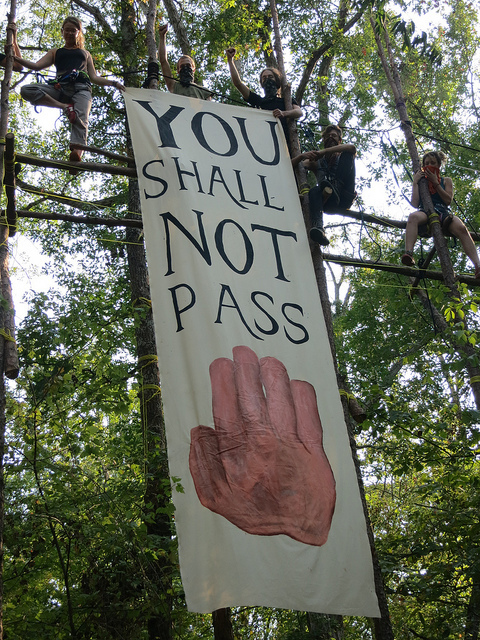 In January, MORE, RAMPS, BMIS and members of the Black Mesa/Big Mountain communities are coming together for the 1st urban Winter Action Camp in St. Louis as yet another part of the growing national uprising against economic and resource extraction. Build community organizing & direct action skills. 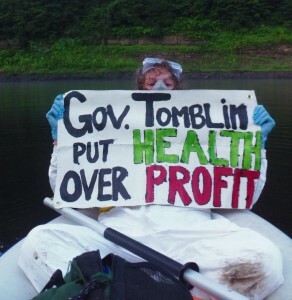 Hold CEOs accountable. Grow a movement. Join the winter action camp. Show your support for Mary and our seven other blockaders with a generous donation to help keep them supplied with food and water. 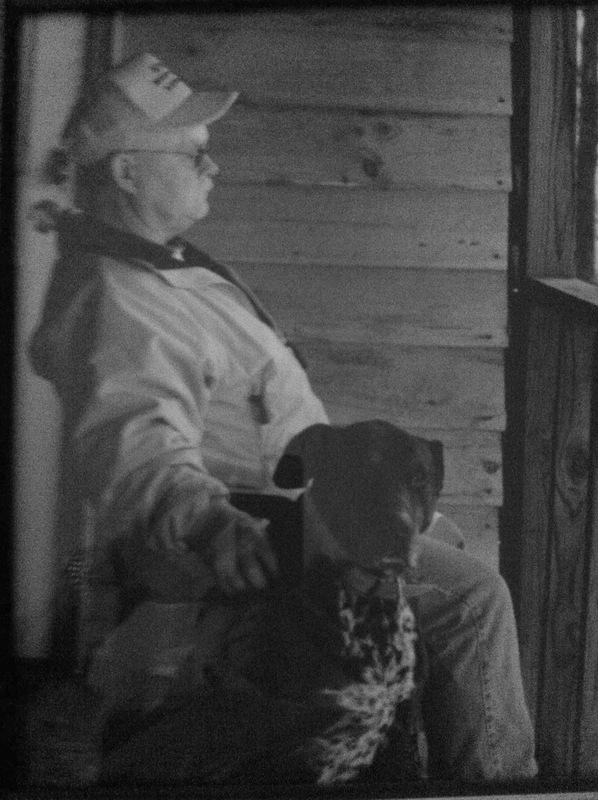 Larry Gibson, long-time environmental activist, died of a heart attack Sunday, September 10, while working on Kayford Mountain, the family home in Raleigh County which he spent the last decades of his life protecting from the coal mining practice known as mountaintop removal. A private funeral is planned, and Larry’s family has requested that persons wishing to express condolences make donations to Keeper of the Mountains Foundation, which Larry founded in 2004 to support mountain communities. A public memorial service will be announced at a later time. Larry is survived by his wife, Carol, two sons Cameron and Larry, Jr. and his daughter, Victoria. He was sixty-six years old.